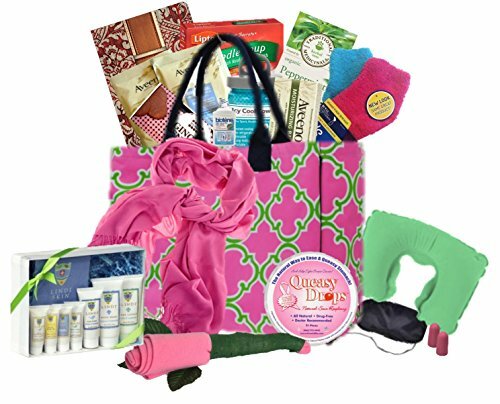 The Best Cancer Gift Care Package for Women for Chemo and Radiation Comfort. XL CANVAS TOTE BAG Double Canvas Handles Inside Zipper Pocket Handle Drop 7" Material:Canvas Pashmina Wrap Scarf (silk/cashmere feel) can be used as throw, Dimensions:18"(L) x 14"(H) x 6"(W)ad wrap or scarf Organic Peppermint Tea (16ct bags) for nausea Icy Cool Towel - Reusable Dr. Scholl's Spa Socks with Grippers Pair One Dr. Scholl's Spa Socks with Grippers Pair Two Biotene Mouth Rinse - travel size bottle Ginger Snap wafer cookies (appx 40-50 cookies) - great for nausea Queasy drops - all natural by Three Lollies - great for nausea Aveeno Moisture Bar - fragrance free w/ natural colloidal oatmeal (full size 3.5 oz) Aveeno Active Naturals Soothing Bath Treatment 1.5 oz fragrance free with colloidal oatmeal - 2 packets Petite Elegant Crossword Puzzle Book Neck pillow Satin Eye mask Earplug set (colors vary) 4 Purell Sanitizing Hand Wipes Lipton Noodle soup mix with chicken broth (2 pouches) Saint G Chemo Beanie arrives fashioned into a Rose Radiation Lindi Skincare Essentials Kit: This starter kit comes with sample sizes of our most popular products, including: Body Lotion, Body Wash, Citrus Face Serum, Lavender Face Serum, and Soothing Balm. If you have any questions about this product by Just Don't Send Flowers, contact us by completing and submitting the form below. If you are looking for a specif part number, please include it with your message.